What's a siphon feed sand blaster and why would you need one? As many of you know, I get a lot of use from my mini sandblaster, but for larger jobs and paint (like my new rustier Mustang project) I needed something that wouldn't run out of air so fast. So I finally broke down and bought a 60 gallon compressor.And now that I have a larger air compressor, I've noticed a few things. Even with my mini sandblaster, the jobs were quicker and better. Although I could get through one hopper of media before the small compressor needed to spool up, I noticed that the extra power of the larger compressor made more progress with the same amount of sand. I needed to know when priming and painting that my job wouldn't be ruined from a fall off of air pressure. So I bit the bullet and got one of these shiny new 60 gallon compressors. Since I now had air volume coming out of my .... I thought it might be time to check out a siphon feed sand blaster. Along with the pure speed increase, the fact that the hopper could hold a whole 50 lb bag of media, meant I could cover a large area without filling and re-filling. Although this gravity feed sand blaster is not huge, it's nonetheless a bit oversized for touch ups, like spot rust removal. For that, I still use the mini media blaster. While the mini sandblaster usually retails for less than $60, the larger media blaster prices have a much bigger range. Prices start at around $150 and can run upwards of $2,000 for a big commercial unit. If you want a decent shop unit that can take anything you put to it, you may want to check this one out. 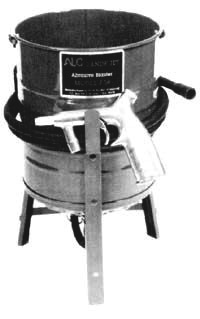 It's the ALCF50 Siphon Feed Sand Blaster Kit . It has a 50 lb capacity, so it takes one standard bag of media and it works with the various abrasives and liquids on metal, plastics, wood and other surfaces. It comes equipped with three steel nozzles; 13/64, 1/4 and 5/16 inch sizes. The kit also includes three air jest, of 5/64, 1/8 ,and 5/32 inch diameters.